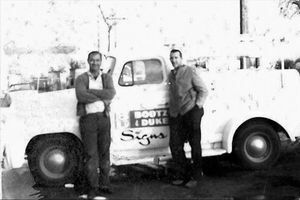 In 1964 Charlie Bootz and Jim Duke started Bootz & Duke Sign Company. They both worked at Myers Leiber Sign Company for several years and then decided to venture out on their own. Bootz & Duke Sign Company was small at first, specializing mostly in hand lettering and painted signs. Over the next 10 years Bootz & Duke Sign Company grew into a full service sign company. In 1975 Bill Gibson, began his career at Bootz & Duke Sign Company. He began digging holes but because of his hard work he quickly became a journeyman installer and soon became the foreman at Bootz & Duke. Bill showed a natural talent for sales and created several new accounts for Bootz & Duke Sign Company. In 1976, Charlie Bootz’s son Jeff graduated from ASU and began working for Bootz & Duke Sign Company. A few years later in 1978 Jim Duke decided it was time to retire. Charlie Bootz , his wife Nellie Bootz and their son Jeff bought out Jim Duke. Over the next 15 years Charlie Bootz, Nellie Bootz, Jeff Bootz and Bill Gibson managed Bootz & Duke Sign Company. in 1991 Charlie and Nellie Bootz decided it was time to retire. Jeff Bootz took over as President and Bill Gibson took over as Vice President. 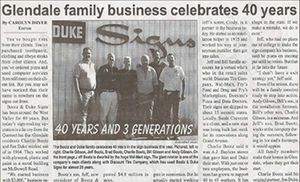 In 1997 Bill’s sons Charlie and Andy Gibson began working at Bootz & Duke Sign Company. Charlie worked in the fabrication department and Andy worked in the Installation department. In 2006 Jeff Bootz chose to step down from ownership. Bill and Cindy Gibson then became the owners of Bootz & Duke Sign Company. 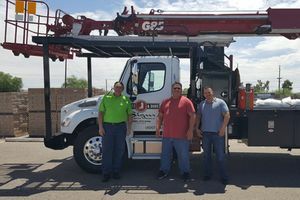 Today, Bill Gibson now manages the day to day operations of Bootz & Duke Sign Company with the help of Brent VanDeman our General Manager, Andy Gibson our Vice President, Charlie Gibson our Sales Manager and Lynne Strattan our office manager who has worked at Bootz & Duke Sign Company for over 11 years.